As I’ve started this drawing of Grand Central Terminal, another memory of September 11 came to mind. As many people were reported missing, posters went up all over looking for missing loved ones. 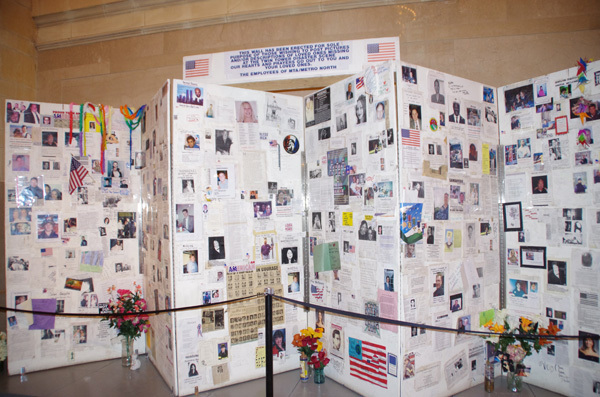 Eventually, the Terminal put up a wall, at first as a place to post searches, and unfortunately, it became a memorial. On anniversaries, birthdays, people would place flowers in lieu of an actual grave. Many memories of Grand Central Terminal are coming back. At my new job, where I am training, one young man declared “Grand Central is where employees go to die”. I hope not, I treasure the place so. Memories about of how, as a young art student, I would come into New York from Connecticut, and Grand Central would meet me. Of course, it was a dangerous, dirty place back then, but it was still my link. I’ve worked on the 5×7 sketch. I decided to keep the woman in the same proportion as she is in the photo….without doing that, the drawing had no strong focal point. 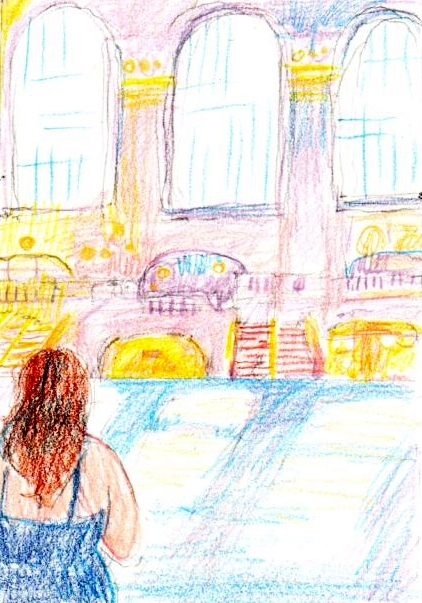 I also plan to keep it low-key and watercolor-like, since in the morning, the Main Concourse is bathed in light. Here’s the sketch. Previous PostWhich is more awesome?Next PostWhat the Hell do you think this is????????????? Grand Central Station?